Our journey to becoming a successful PLC school started four years ago when our school district made professional learning communities a priority. At that time, Westridge staff members made the collective commitment to establish a collaborative culture in our building to support high levels of teaching and learning. This started when we formed teams of teachers who have common time during the school day to meet as a team. It was our goal to remove all barriers that could get in the way of this important work in our building. At the same time, we created building and team norms, established clearly defined roles and responsibilities, and created an agenda that was used by all teams and focused on the Four Essential PLC questions. It took some practice and a lot of modeling but our grade level teams learned along the way what it takes to function as a learning community. It was years two and three of implementation when we really strengthened our professional learning communities. We attended three PLC Institutes and walked away with a lot of ideas on how we can improve professional learning communities in our school. Most of our takeaways were implemented immediately including increasing the amount of uninterrupted team time each week. One big takeaway for us was the need to redesign our master schedule to provide common meeting time for teacher times and to provide a daily block of time for intervention and/or enrichment. The revised schedule also provided an opportunity for core+ teachers to be available to work with all grade levels. The PLC Institute also provided some new strategies to tighten up the roles and responsibilities for each teacher team to keep the focus on teaching and learning. That same year we partnered with Solution Tree by participating in a six day district wide PLC Academy facilitated by Thomas Many. We learned a lot about the importance of establishing a Guaranteed and Viable Curriculum and how to use instructional protocols to guide our work as a team. The biggest turning point for our teacher teams that year was the development of common units of instruction that are fully aligned with the Common Core for each grade level. We had each teacher team identify the essential standards for both reading and math. From there, we unpacked the essential standards and aligned them into common units of instruction. For each unit, teachers collaborated to develop common learning targets, common “I Can” statements, and of course common formative assessments. Our teachers are now fully committed to aligning curriculum, instruction, and assessment for each grade level. This process allowed our teachers to take ownership as a team in what they are teaching and how they know when students have met the intended learning outcomes. We have come a long ways in four years and are still fully committed to continuous improvement for professional learning communities. The most rewarding part of this work for our teachers is that our math and literacy data continues to improve each year. Using teacher created or agreed upon common formative assessments and other benchmark assessments, teachers collectively meet weekly to analyze data to make instructional decisions. We use a data tracking system to monitor student progress towards the agreed upon essential standards for each grade level. Teachers update their data tracker before each team meeting so they are prepared to work as a team to identify trends. Common assessments are administered before, during, and after each common unit of instruction in the content areas of reading and math. Each unit of instruction will last three to four weeks, depending on how many priority standards the unit is designed to cover. During the weekly team time, teachers look at the common formative assessment data and use the majority of the time to determine instructional strategies to meet the needs of their learners. Teachers are becoming more vulnerable to share the data of their students, ask questions on how to improve their instruction to meet the needs of the students, celebrate successes, and set instructional goals. At the end of each weekly PLC, teachers are committed to determine the next PLC agenda to include a follow up to ensure ongoing student learning of the priority standard and essential learning targets. In addition to data that is collected and analyzed within our building, the state of Iowa allows schools to administer statewide assessments for literacy. This happens three times a year and the data is monitored closely. After each testing window, teachers meet to analyze their data and develop a plan for how they will adjust their core instruction based on their grade level data. Teacher teams also develop an individual plan for students who are not displaying adequate growth. Within this plan interventions are selected and monitored weekly for each student. As a building we have identified several data analysis protocols that teacher teams use to monitor and respond to our student achievement data. At Westridge Elementary, we have a Multi-Tiered Systems of Support (MTSS), that involves the systematic use of assessment data to efficiently allocate resources in order to improve learning for all students. To ensure efficient use of resources, Westridge teacher teams begin by identifying trends and patterns using school-wide and grade-level data. Within our MTSS framework, all school-based efforts such as teaching the Iowa Core Standards, PLC’s, Essential Elements of Instruction (EEI), personalized learning, and continuous school improvement are unified and accelerated by collaborative teaming which has resulted in increased student achievement. In Tier 1 instruction, all students receive high quality, differentiated, culturally responsive core academic and behavioral instruction through the general education program. Universal instruction is differentiated in the classroom to meet the needs of all learners, including those with special needs and students who are gifted and talented. In Tier 2 instruction, we have a daily 30 minute intervention and enrichment block called “What I Need (WIN Time).” Our grade level teams have a collaborative approach to planning this intervention/enrichment block. It starts with reviewing multiple data points as a team to determine what kind of support our students need. 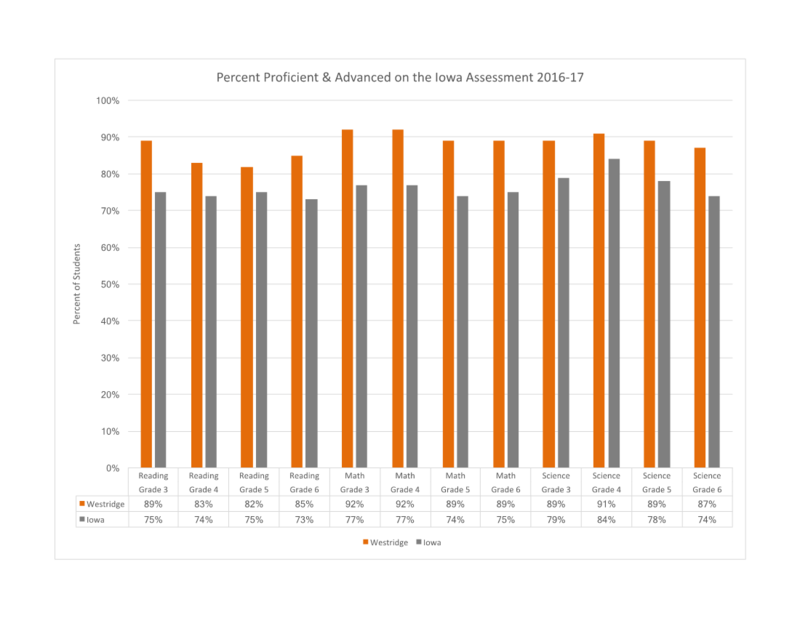 The data points we review are: grade level common assessments, statewide literacy assessments, district math assessments, and classroom observations. From there, teacher teams plan a variety of interventions and/or enrichment activities to meet the students where they are at with their understanding of the agreed upon essential standards. During WIN time, we have an “all hands on deck” approach in which our Core+ support teachers are available to provide support in the classroom or in a pull-out setting. Our "all hands on deck" approach includes the following Core+ teachers: reading specialists, special education teachers and associates, English Language Learning teachers, instructional coach, and extended learning program teacher. In the lower elementary grades, we also train and include our classroom associates to assist during WIN time. It is also common for grade level teams to share students based on what their instructional need is. Teacher teams make data-driven decisions and then select several high impact interventions or enrichment activities to provide our students. Tier 3 instruction is supplemental, individualized and customized intervention provided for approximately 5% of our students in a smaller group format and delivered with greater frequency and duration than Tier 2 support. Students in Tier 3 continue to receive core instruction at Tier 1 and in most cases will receive Tier 2 support. Interventions at Tier 3 are tailored to the student’s needs to fill gaps in skills below grade-level and provided by a highly trained, knowledgeable, and skilled educators. We started building high-performing collaborative teams by providing ongoing PLC professional development which included utilizing resources and videos from Global PD. It was important for our teachers to understand the “why” of PLC’s as we embarked on this powerful instructional framework for our building. We spent quite a bit of professional development time learning about various components of proven professional learning communities. We also tapped into the strengths of our staff by having them model certain strategies or allow us to video their team meetings to share with others. We emphasized the importance of collectively analyzing building data and determining goals that reflect improved student learning; this is an ongoing process for our school. We went from teaching what is in the curriculum planner to developing common units of instruction and assessments that are aligned with the common core for each grade level. We now have access to real time data that we analyze and adjust our instruction accordingly. This has provided our teachers the opportunity to personalize learning in their classroom. We Incorporate data days where teams of teachers have an extended period of time to dig deeper into data and determine core instruction and intervention needs. This has led to so many powerful conversations about responding to student achievement data with effective instructional strategies. It has naturally increased collaboration in our building. Every teacher team collaborates weekly for at least 90 minutes as a PLC team, including instructional coach, special education teachers, ELL instructors, ELP teacher, resource teachers, and administration. Our uninterrupted PLC team time takes place every Wednesday morning before school. We have student release time every Wednesday for staff development and we choose to use this for team time and engage in professional development a different day of the week. We also make it a point to to have our new professional learning carry over to the next team time meeting. Each grade level team also has at least 90 minutes of common planning time throughout the week. Our specials teachers also have weekly and monthly PLC team time. They meet as a department and attend grade level team meetings to explore and discuss any cross-curricular opportunities. Specials teachers meet monthly with their district-wide PLC to focus on curriculum, instruction, and assessment. We have built an “all hands on deck” environment which has led to the mindset of they are all “our” students. Utilizing a PLC template form that is consistent throughout the entire building. At the top of the agenda, there are menu items that focus on student learning; this helps to ensure doing PLC right vs. light. Each teacher team shares their PLC agenda with all Core+ teachers who provide support for our students. This allows all support teachers to monitor what is happening in each grade level and attend specific team meetings if necessary. Providing ongoing feedback to teacher teams based on the documentation from our common PLC agenda template has been an effective way to build capacity. Grade level teams share their agenda with our instructional coach and administration to view and respond as needed when we are not able to attend a meeting. Our district also utilizes a PLC walk-through form that is designed to provide meaningful feedback to teacher teams. 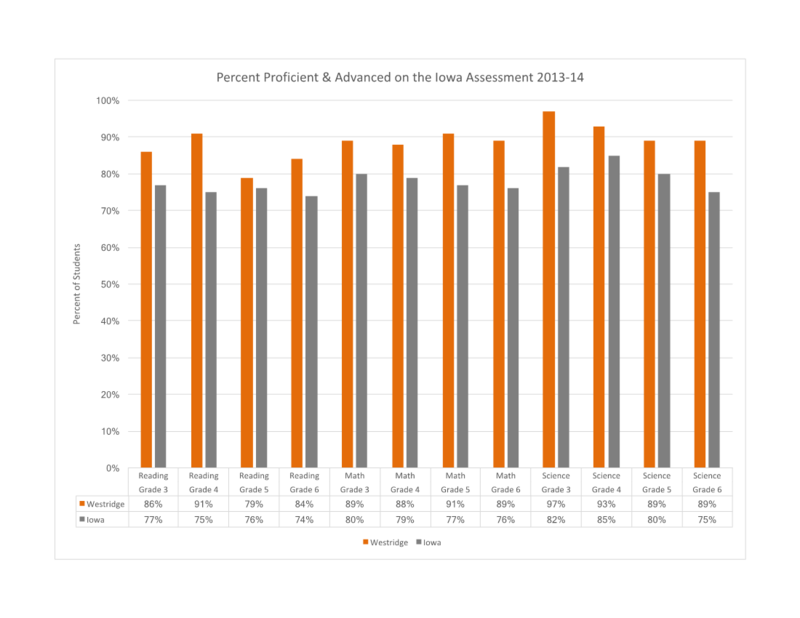 Please click on the link below to view historical student achievement data for Westridge Elementary. Westridge Elementary is in it's fourth year of being a Leader in Me school. The Leader in Me program aligns well with professional learning communities. Goal setting is a common practice in Leader in Me and all of our students develop and monitor a Wildly Important Goal (WIG). A new WIG is added each trimester and focuses on academics. Along with setting goals, every student has their own Leadership Notebook that is shared with parents at conferences. The notebook contains student achievement data for each student and connects it to the 7 Habits for Happy Kids.